Hong Kong-based businessman Carson Yeung has made a £1-a-share cash offer for Birmingham City FC, which values the club at £81.51m ($134.6m). If the deal goes through it will mean that half of the clubs in the English Premier League are foreign-owned. Mr Yeung's Grandtop International Holdings bought a 29.9% stake in the club in June 2007, but stopped short of buying the rest. Grandtop has now received acceptances that would take its holding to 80%. It made a £3m deposit for the English Premier League club on Thursday. In a statement to the London Stock Exchange, Grandtop said it planned to "develop the club by investing in and strengthening the squad and infrastructure of the club over time". Grandtop also said that the primary aim of ownership would be supporting the club to "help it retain its Premier League status". It added that it planned to "significantly increase its global fan base", especially in Hong Kong and mainland China. "It is intended that the current first team manager, Alex McLeish, will continue in this role, supported by his existing backroom team," it added. Grandtop also said that Karren Brady would remain in place as managing director of the club should its takeover succeed. Grandtop's directors include the former Liverpool and Real Madrid midfielder Steve McManaman. The company itself has been loss-making for each of the last four years, losing 91.8m Hong Kong dollars (£7.2m) in the year to the end of March 2009. Its shares were suspended in Hong Kong ahead of the announcement. It has taken out a £57m bridging loan to fund the takeover, which will then be paid back using the proceeds of a share offer in Hong Kong. Mr Yeung will add to the growing list of foreign club-owners in the English Premier League, which includes the Glazer family at Manchester United and Sheikh Mansour Bin Zayed Al Nahayan, owner of Manchester City. 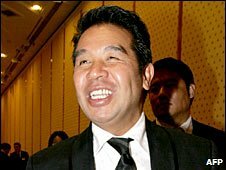 Mr Yeung was criticised by the Birmingham board in 2007 for not completely buying out chairman David Gold and co-owner David Sullivan. The Hong Kong businessman had been set a deadline of 21 December 2007 to complete his buy-out, but the Blues released a statement to the Stock Exchange on 20 December 2007 to announce that discussions had been terminated.